Business growth is undeniably embedded in all your company’s goals. As your company expands, however, you’ll need to leverage more resources to support your growth. Integrating an ERP solution too soon in your business can easily lead to increased confusion and decreased productivity. A key component of choosing and implementing an ERP system that will bring your business the best benefits is understanding the language of ERP. 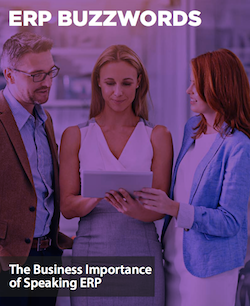 This guide will explain the business importance of speaking ERP and highlight the main ERP buzzwords you should know to help make the most of your ERP solution.